In previous blog https://blogs.sap.com/2018/10/08/hana-text-analytics-use-case-part-1/, we have seen how to define table with RAWSTRING field and full text index activated. In this , we will see uploading the PDF content from application server abap program into table and using AMDP perform the required validation on the uploaded document. Create an AMDP method to query on the Full index table based on the required validation The above logic help us to determine and verify if the uploaded document is matched against the mentioned document number. 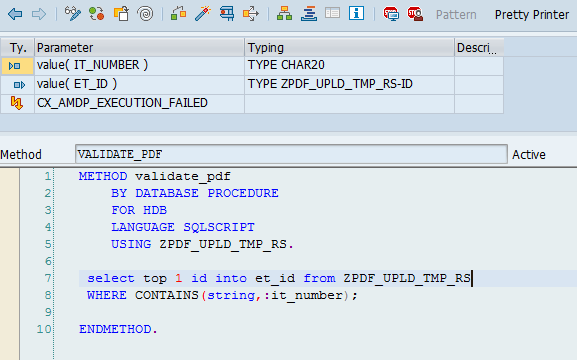 Create an ABAP object to upload PDF file from application server and insert the XSTRING PDF content in to the table. File can be uploaded using CL_GUI_FRONTEND_SERVICES=>GUI_UPLOAD in binary format. Once the record in inserted in to the table, call amdp method to search the document content based on the input selection parameters Here document is been uploaded against incorrect invoice number. Validated successfully. Uploaded document is verified for the input document number.